Pounding chicken breasts until they are as thin as you can get them softens the fibres and tenderises the meat beyond recognition. The tart, creamy yogurt dressing works well with other ingredients such as grilled prawns or lamb chops, so it’s worth hanging on to any that's left over. Slice each chicken breast into three even-sized pieces, place them on a chopping board with a freezer bag over them and pound with a mallet or rolling pin until they are about 5mm thick. 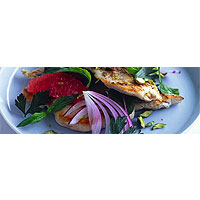 Put the chicken escalopes in a flat ceramic dish and pour 4 tbsp of the olive oil over them. Distribute the lemon over the chicken, season with pepper, cover and marinate in the fridge for 30 minutes. Meanwhile, stir the dressing ingredients together in a small bowl until the oil is blended. Season well. Place a large frying pan over a high heat for 2 minutes. Remove the chicken from the marinade and sprinkle it with salt. Cook in the pan for 1 minute each side or until cooked through and golden. Toss the pistachios, onion and grapefruit in the remaining olive oil, season well and divide between 4 plates. Top each with 3 pieces of chicken and the parsley and mint leaves. Serve dressing on the side.